The tetrapods radiated into about 40 families in the Carboniferous. Classically (e.g. 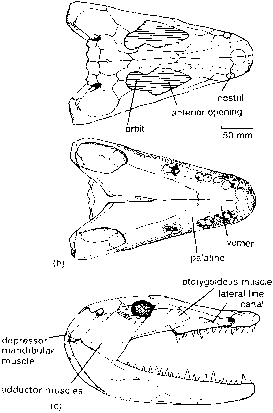 Romer, 1966), the basal tetrapods were divided into three main groups, the Labyrinthodontia, characterized by the labyrinthodont tooth structure (shared with derived sarcopterygians, Figure 3.24e), large body size, and compound vertebrae; the Lepospondyli, characterized by small size, simple tooth structure, and fused spool-like vertebrae; and the Lissamphibia, the modern groups such as frogs and salamanders. It is clear, however, that the 'Labyrinthodontia' at least is not a monophyletic group, based on modern cladistic analyses (see Box 4.5). The Early Carboniferous used to be a poorly known time interval in tetrapod evolution, but many new species have been described in the past 10 years. Their relationships are still much debated—whether they are basal forms, basal 'temnospondyls' or basal 'anthracosaurs'. The colosteids, such as Greererpeton from the Lower Carboniferous ofWest Virginia, USA (Smithson, 1982), have an elongate body with 40 vertebrae in the trunk and neck, a broad tail and short limbs (Figure 4.8). The skull is very different from that of anthracosaurs: the eyes are placed further forward, the skull and lower jaw are lower and flatter, and there is no otic notch. The lateral line canals are also well developed, suggesting an aquatic lifestyle. Scotland (Clack, 1998b), was quite different (Figure 4.9(a-c)). It has a large skull with heavily sculptured bones. The deep embayments in the side of the skull just behind the eyes are generally called temporal (or otic) notches, and it was once assumed that these accommodated a tympanum,or ear drum, which was supposedly linked to the inner ear by the stapes. In basal forms such as Crassigyrinus, this space was more likely occupied by a spiracle, a remnant of an anterior gill slit still seen today in sharks. With its deep skull and sharp fangs, Crassigyrinus was clearly a meat-eater with powerful jaws that could have seized large fishes and resisted their struggles in the mouth. Crassigyrinus has minute fore-limbs, a long narrow body and probably a flattened tail bearing a broad fin. were the first tetrapods adapted more to walking than swimming. The baphetids, or loxommatids, are known from various Carboniferous localities (Beaumont, 1977; Clack, 2003b). Megalocephalus from the Early Carboniferous (Figure 4.10(a-c)) has a small rounded orbit that extends into an unusual pointed structure in front, which might have housed a gland, or have been a site for muscle attachments. There are traces of lateral line canals. The jaws are lined with short pointed teeth, and there are about six larger 'fangs' set into the bones of the palate. The skull is very low; in fact it is only about as deep as the lower jaw, so that accommodation for the brain was clearly not a priority! Almost nothing is known of the postcranial skeleton, the skeleton behind the head region, of any baphetids. Large jaw muscles probably ran from the side of the skull to the upper surface of the lower jaw, and these adductor muscles acted to close the jaw (Figure 4.10(c)). The jaw opened by means of a smaller jaw depressor muscle that ran behind the jaw joint. This is a tetrapod novelty, and represents a further shift from fish-like anatomy in which basibranchial muscles connecting with the shoulder girdle depress the jaw. Muscles can only pull, and the solution of placing a jaw opener behind the pivot joint of the jaw is adopted in most tetrapods. The temnospondyls are the main Carboniferous tetrapods, a group that survived in abundance through the Triassic, and with much reduced diversity into the Early Cretaceous, a total span of over 150 Myr. During this time, 170 genera in 40 families have been recorded. 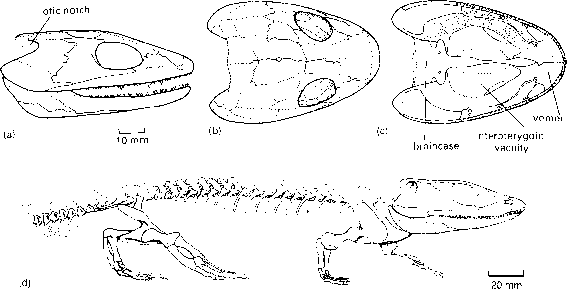 Balanerpeton from the Lower Carboniferous of Scotland (Figure 4.5(e)) and Dendrerpeton (Figure 4.11) from the Upper Carboniferous of Nova Scotia, Canada (Holmes et al., 1998) have broader skulls than most an-thracosaurs, and they have a rounded front margin, which is typical of temnospondyls. 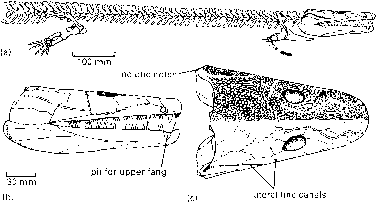 The palate of Dendrerpeton (Figure 4.11(b)) shows several characteristic temnospondyl features; a broad open space in the middle, the interpterygoid vacuity, which is very small in anthracosaurs, a long narrow process from the brain-case that runs forward across the interpterygoid vacuity, and a pair of broad flat vomers at the front. The arms and legs are stout, the shoulder and hip girdles strong, and there is a slender sound-conducting stapes, all of which suggest that Dendrerpeton was a largely terrestrial animal. tanus, an early form from the Upper Carboniferous of Ohio, USA (Figure 4.12(a, b)), was a highly terrestrial animal, having the proportions of a lizard, with powerful limbs and a strong skull. Its short teeth were adapted for crushing and piercing the tough skins of invertebrates such as insects, spiders and millepedes. 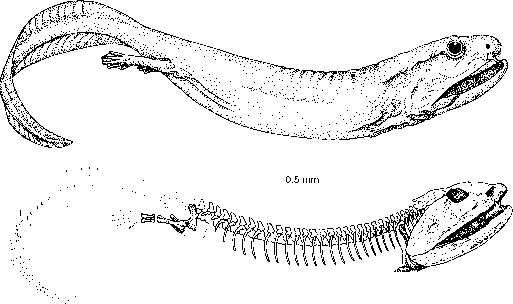 Other microsaurs, such as Microbrachis (Figure 4.12(c)) from the Upper Carboniferous of the Czech Republic (see Box 4.4), seem to have been secondarily aquatic, with long slender bodies, and reduced limbs and limb girdles. Some microsaur lineages show reduced skull bones, massive occiputs (the posterior part of the skull roof), long bodies, and short legs, which suggest that they were burrowers or leaf-litter foragers. The nectrideans (A. C. Milner, 1980) were an aquatic group, known from the Late Carboniferous and Permian. Many, such as Sauropleura from the Upper Carboniferous of Europe and North America (Figure 4.13(a)), are newt-like in appearance, with very long flattened tails that were presumably used in swimming. The caudal vertebrae of these forms (Figure 4.13(b)) have remarkable ornamented symmetrical spines above and below, part of the deep flat-sided tail that was used for propulsion. Diplocaulus and Diploceraspis from the Upper Carboniferous and Lower Permian of midwestern USA (Figure 4.13(c-f)) have dramatically expanded skulls marked by enormous 'horns' growing out at the sides, which gives the head a boomerang-like appearance. The extensions are formed from massive outgrowths of the squamosal and tabular bones, which normally form relatively small parts of the back corners of the tetrapod skull. Juveniles have almost no horns at all,but a study of hundreds of specimens of Diplocaulus at all stages of growth (Olson, 1951) shows how they grew out more and more as the animals became older (Figure 4.13(f)). The function of the nectridean horns is more of a problem. Biomechanical studies (Cruickshank and Skews, 1980) on models of the head of Diplocaulus have shown that its hydrofoil shape provided lift when it was held roughly horizontal or just tipped up in even very weak currents. Perhaps Diplocaulus and Diploceraspis fed on fishes that they caught from a lurking position on the river or lake bottom. They flicked their tails sharply, rushed up from beneath, grabbed a fish, and rapidly sank to the bottom again to enjoy their feast. those of most other early tetrapods, a condition termed holospondylous. The upper portion of the vertebra, the neural arch, which encloses the spinal cord and provides sites for muscle attachment, is fused to the main body of the vertebra, the centrum.Similar vertebrae are seen in nectrideans and microsaurs. The aistopods are assumed to have lost their limbs secondarily, rather than to have evolved directly from a limbless fish ancestor. Their long trunk and short tail are similar to snakes, and some aistopods at least may have been able to open their jaws unusually wide because of extra joints in the skull. Perhaps the aistopods filled terrestrial and semiterrestrial snake-like niches.